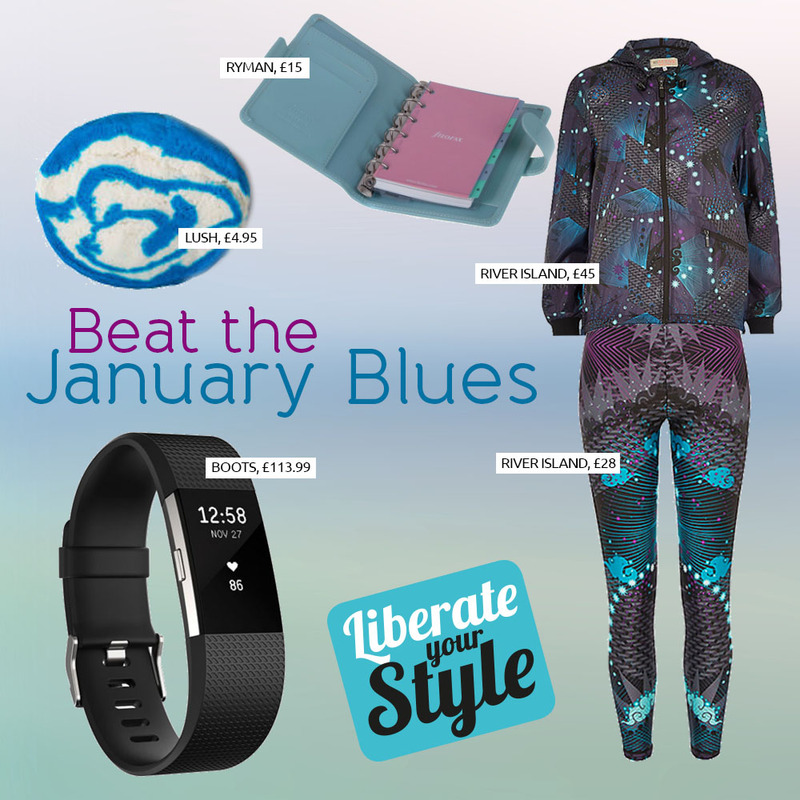 January, the month when cold weather, dark mornings and failing in our new year’s resolutions collide to create those notorious ‘January Blues’. But fear not, The Liberty is here to lift your spirits and boost motivation with our top tips for a happy and healthy start to 2017. Looking to get organised in 2017? This Filofax Pocket Organiser (£15) from Ryman could help. With its magnetic closure and brilliant blue colour, this diary is ideal for your handbag and will help to make sure you don’t miss a date! Pencil in your plans -January bringing you down? Why not add all of your exciting 2017 plans to a wall calendar? By doing this you can visibly count down to your special dates and have something to look forward to during the gloomier months. New Year, New You – Ensure you are looking fabulously fit with River Island’s new RI active range. This green printed hoodie rain jacket (£45) is a practical yet fashionable addition to your workout wardrobe. It even comes with an adjustable hood and is made from water repellant fabric for the wetter weather. Get the endorphins flowing – Exercise releases feel-good hormones called endorphins that trigger a positive feeling in the body. Why not track your new year efforts and treat yourself to This Fitbit Alta Fitness Wristband from Boots (£84.49)? Not only does it track steps, workouts and calories burned, it also monitors sleep and is the perfect device to kick start a healthier, happier you. Train in twos – Hate the thought of exercise? Exercising with a friend is a great way to have fun whilst staying motivated. Set yourself realistic challenges and download applicable exercise apps/programs to work to. Float away your troubles – Find it hard to wind down after a stressful day? Wash away your worries with this ‘Blue Skies And Fluffy White Clouds’ bubble bar from Lush (£4.95). This bath luxury can be used more than once and contains natural relaxants such as patchouli and frankincense for the ultimate calming combination. Share the love – Finally, a great way to beat the blues this January is to do something for another, so why not treat a stranger to a coffee the next time you’re in Starbucks? Simply pay for your coffee and that of the next customer. There, doesn’t that feel nice?